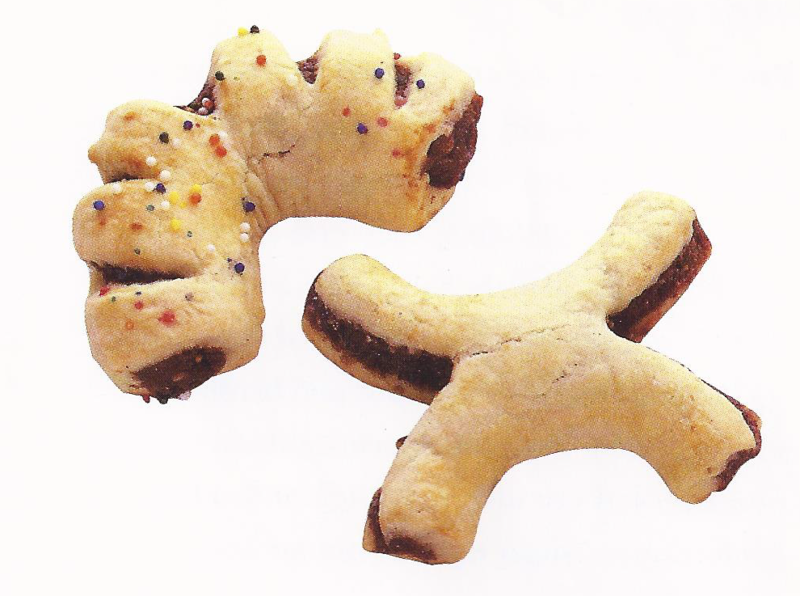 The cookie on the left is a cucidato , a traditional Sicilian Christmas cookie with a fig and dried/candied fruit filling enclosed in pasta frolla, the Italian sweet pastry dough. The one on the right is an X cookie, made from the same dough and filling and popular in pastry shops in Calabria and Sicily. The recipe makes quite a few cookies, and making some of each type is a little less labor intensive than making all cucidati. These are a bit of a project to make, but are worth every minute of it. The filling may be prepared, covered, and refrigerated up to a week in advance, and the dough a couple of days before you form the cookies. The process of assembly is the most time-consuming part, though it goes quickly if you divide up the work among several people. Once baked, they keep well for a couple of weeks at a cool room temperature or they may be frozen. To make the dough, combine the flour, sugar, baking powder and salt in the bowl of a food processor fitted with the metal blade. Pulse 3 or 4 time to mix. Add the butter and pulse repeatedly until it is finely mixed into the dry ingredients. Add the eggs and continue to pulse until the dough forms a ball. Invert the dough to a floured work surface and carefully remove the blade. Form the dough into a fat cylinder and wrap it in plastic. Chill until you intend to prepare the cookies, up to 3 or 4 days. For the filling, combine all the ingredients in a large mixing bowl and stir well to mix. Scrape the filling into the bowl of a food processor fitted with the metal blade. Pulse repeatedly until the filling is finely chopped and holding together, but not ground or pureed. Scrape the filling into a bowl, cover and reserve it. It keeps refrigerated for a week. To make the cookies, set racks in the upper and lower third of the oven and preheat to 350 degrees. Remove the dough from the refrigerator to a floured surface. Gently knead the dough to soften it until malleable. Roll the dough into a cylinder 15 inches long and cut it into 15 1-inch slices. Set them aside. Repeat with the filling, using a bit more flour on the surface. To form the cookies, clean the work surface and flour it lightly. Roll one of the pieces of dough under the palms of your hands until it is about 8 inches long. Flour under the dough again and use the palm of your hand to flatten it until it is about 3 inches wide – if you use a rolling pin for this, flour the top of the dough and don’t roll over the long edges or it will distort them. Slide a thin metal spatula under the strip of dough to make sure it isn’t stuck. Flour another part of the work surface and roll one of the pieces of filling under the palms of your hands until it is 8 inches long. If you do this behind the strip of dough, you can roll it right onto the dough without having to lift it. Center the filling on the dough and lightly egg wash the exposed edges of dough, using a brush. Draw the dough around the filling to enclose it and make a long cylinder. Roll the cylinder under the palms of your hands to lengthen it to about 12 inches, being careful not to point the ends while rolling. Use a paring knife to cut the cylinder into four 3-inch lengths. Seam side down, flatten each cookie slightly and slash the top diagonally in 4 or 5 places. Form the cookie into an arc so that the slashes open. Egg wash lightly, then sprinkle with the nonpareils. Arrange the cookies on one of the prepared pans and repeat with the remaining dough and filling. Bake the cookies until they are golden and firm, about 15 to 20 minutes. About halfway through the baking time, switch the pan from the lower rack to the upper on and vice versa, turning the pans back to front at the same time. If your oven gives strong bottom heat, bake the pan on the lower rack stacked on another pan. Bake the remaining pan of cookies on the middle rack. Cool the cookies on the pans on racks. Store the cooled cookies between sheets of wax paper in a tin or plastic container with a tight-fitting cover. After step 8, make a 1-inch cut inward from each end of the cookie and gently pull the slashed areas open on each end to form an “X.” Bake and cool as above and dust lightly with confectioners’ sugar before serving.